The IPCC changed their fundamental philosophy on how they evaluate scenarios of our future climate in their 2013 reporting, but they have yet to acknowledge the most common and meaningful way our climate usually changes, implying negative consequences for traditional climate reform strategies. Popular science however, continues on the path of traditional climate reform strategies that were first suggested with the Kyoto Protocol that started in 1992. The Environmental Research Letters article that identifies reduction of number of children in a family is the latest. (Wynes 2017) It evaluates only GHG emissions in the long-term time frame, without regard to net warming and the short-term time frame. Summary: Almost all current consensus climate reform strategies do not take into consideration net warming and the short-term time frames. This is important because risks of abrupt change are higher in the short-term, with any additional warming, relative to risks of long-term impacts. This means that a healthy climate and very large negative emissions (1,000 Gtons) are needed to reduce the greatest risks. The consensus and policy disregard for net warming and the short-term time frame has implications for strategy and risk. Example: air travel, considering short-term net warming in the 10 to 50 year time frame, has a slight net cooling (not warming) effect because of global cooling sulfate emissions not taken into consideration with traditional long-term climate reform strategies (Unger 2010, Figure 1). Long-term warming is still important, but the risk of abrupt change (100 times more extreme and 100 years faster than previous projections), is higher in the short-term relative to risks from long-term warming. The reasoning that short-term risks are greater than long-term risks is that in the long-term (50+ years), we will eventual achieve climate pollution reform. If implemented under the Paris timelines, atmospheric cooling will begin sometime after 2100, after the global temperature continues to rise until (at least) 2100. But it is continued warming (overshoot) allowed by traditional climate reform strategies that creates the greatest risk. 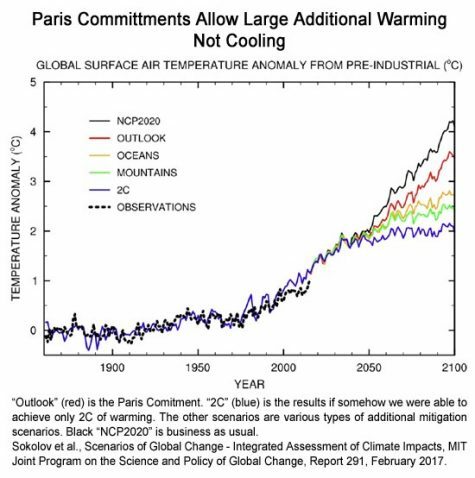 Sokolov 2016 (MIT) says Paris commitments allow +/- 2.1C of total warming above preindustrial by 2050 and 3.5C warming by 2100. If we were somehow to limit warming to 2C with small negative emissions, warming by 2050 would be about 1.9C and continue to slightly warm to about 2.1C by 2100. Moving towards net warming in the IPCC: By the 2013 IPCC report, climate science knowledge had increased enough, and delay had changed the science enough, to reveal that the previous emissions based strategies of future warming were not as meaningful as they were when conceived more than 20 years before. In their 2013 reporting, they radically changed their emissions-based scenarios to loading based (total atmospheric accumulation); from annual emissions based scenarios in 1990–SA90, 1992–IS92, and 2000–SRES “Special Report on Emissions Scenarios” to RCP “Representative Concentration Pathway Scenarios.” What this means is that the SRES (and previous) scenarios were based on annual emission and modeled future impacts based on hypothetical culture, demographics and behavior. The new RCP scenarios look at total atmospheric greenhouse gas loading and net warming as a starting point–the total accumulated global warming and cooling gases and mechanisms in our atmosphere–and then they back in culture, demographics and behavior. This is a great step forward and was taken in large part because annual emissions have become less and less meaningful as atmospheric accumulation (loading) has grown so much. i.e. Since 1985, the amount of accumulated excess man-caused CO2 in our atmosphere has doubled over the previous +/- 250 years. IPCC has acknowledged this change in their 2013 Science Basis Summary for Policy Makers (and other places) with a statement of need for “large net removal of CO2 from the atmosphere…” In other words: negative emissions. So the consensus made the switch from behavior based climate reform to net warming, but because abrupt changes and lack of robust modeling are still not a meaningful part of consensus climate science, the short-term and elevated risks of abrupt change are simply not a part of our climate reform culture. What This All Means — The details of climate reform strategy are important now that decades have elapsed since we developed these strategies that we are currently relying upon for climate pollution reform, and the riskiest meaning is not fully included in our current consensus or policy.